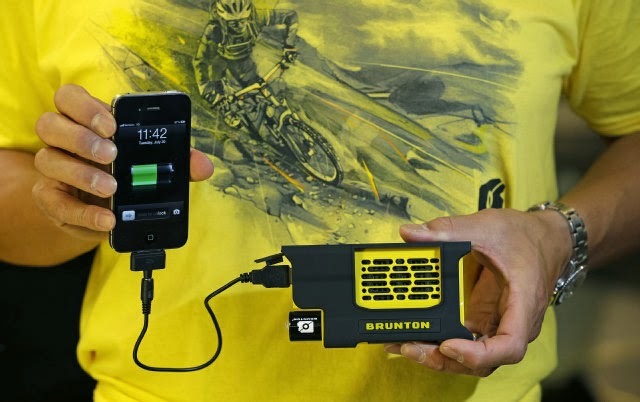 The Brunton Hydrogen Reactor is a hand-held portable recharging system that combines hydrogen with oxygen to create electricity and emits only water as a byproduct. To operate it, you plug a battery-esque Hydrogen Core into the base unit and attach your desired device via a standard USB outlet. At full capacity, the whole system weighs in at a mere 8.5 ounces and packs the power of roughly 15 AA batteries—enough to recharge an iPhone six times. The Reactor retails for $169.99, including two Hydrogen Cores. You can purchase replacement cores separately ($19.99 each) or purchase an H2O Hydrolizer ($279.99) to recharge the cores you’ve got by plugging into a wall socket at home. And don’t worry, you’re not packing a Hindenburg bomb. According to this in-depth review on Wired.com, the hydrogen is stored in a stable hydride state that’s safe enough to satisfy even stringent airline requirements (you can carry up to two Hydrogen Cores on the plane with you). I’m fascinated by this development on many levels. Such fuel-cell technology has been appearing in some vehicles, but it’s remarkable to see it shrunk down to such a small size. It would seem to be a more eco-friendly solution than traditional batteries and the heavy metals they contain. And it’s interesting to see it at such a relatively low price point for an inaugural product; presumably the price will come down as others begin producing similar products. That being said, it still has a ways to go before it becomes cost competitive with other mobile recharging options. Nonetheless, I’m clearly not the only one intrigued by this technology—it’s currently sold out on the Brunton web site.